Some of us have collections of old things that we like to search for while wandering around antique stores, estate sales or just going to the yard sale down the street. Our collections are beautiful things but sometimes kitschy or even weird objects. In my case it’s just more things to dust, but I don’t mind. One of the things I like collecting is old Harlequin pottery. My collection accidentally started in my early twenties when I inherited a couple of pieces after my great grandmother passed away. I’ve always been a big fan of Art Deco design and these simple beautiful pieces suited my taste. Harlequin Art Deco ceramics were designed in the 1930s by Fredrick Rhead who was the art director at the Homer Laughlin China Company. Besides designing the Harlequin pottery line that was produced from 1936 until 1964, he also designed the very popular “Fiesta” pottery line which is still being made today. 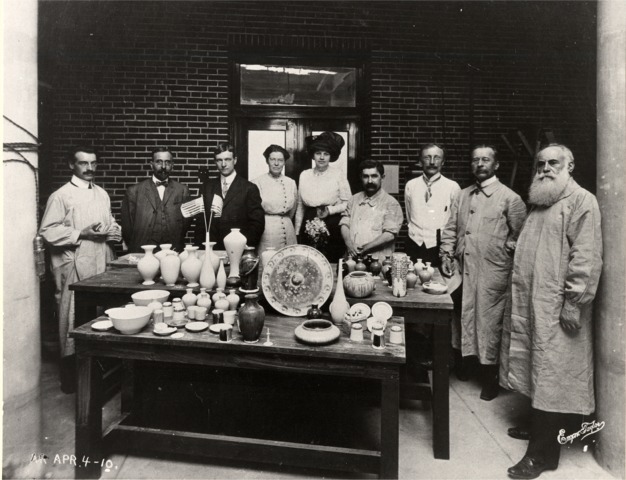 Frederick Hurten Rhead (1880-1942), standing far left, and others at the Art Academy of People's University. Over the years I’ve collected hundreds of pieces, but what’s funny is that I’ve never actually used any of them for their intended purpose. One of these days, I’m going to throw a dinner party and use them. It will surely be a colorful and festive moment! I dread the next time that I have to move, carefully packing each fragile piece and moving the heavy boxes. When this happens, I’m going to wish that my collection was something small, lightweight and easy to pack like old thimbles or antique brooches. Recently, I’ve thought about selling some of the duplicate pieces but for some reason it’s hard to part with them even though my husband and I are childless and these pieces won’t be passed down to anyone when we die. In the end, I suppose I can imagine my Harlequin pottery collection being part of a huge estate sale for other Harlequin collectors to purchase, admire, and enjoy. That would make me happy. I found your site by googling Harlequin Fiestaware. I found a little yellow cup at Goodwill the other day for .49. It may be the beginning of a more expensive endeavor to track down other pieces. Thanks for all this information! Katy, Great Goodwill find! Thanks for reading my blog and good luck with the start of your new collection.